While there are lots of mics hitting the market that are quite inexpensive, the AT2020 is also one such mic. But what makes the difference is the fact that there is no compromise on the quality of Audio-Technica AT2020USB unlike the other cheap mics. Because of the demand for this product, it has a long-running production history and till date, attracts more customers. The success of this model of Audio Technica has led to the production of two more models Audio-Technica AT2035 and Audio Technica AT2050. The Audio Technica AT2020 is a rock-solid condenser mic with the performance of an expensive mic. This mic captures instruments sounds admirably. Adding to it, the way it captures the top end crisply with the lower-mid makes it pleasing on vocals. The AT2020 is a pleasant surprise for those looking at buying a good mic at a cheap price. The AT2020 mic is an ideal mic for studio applications with a surprisingly low price, specifications on par with the big leagues, its smooth frequency response, custom-engineered diaphragm and cardioid pattern. This Audio Technica AT2020 Review is aimed at reviewing in-depth all the highlights, advantages, disadvantages and mainly the top features of this mic. The best thing about the company Audio Technica, is the quality standards that they follow to deliver a professional performance. The AT2020 is a consistent, reliable mic which gives good performance at an affordable price. Here’s a brief Audio Technica AT2020 Review highlighting its superiority in terms of quality. The response of the side-address condenser is 20Hz-20000Hz. Though there is a dip at around 70Hz and a peak between 5000-15000Hz, the mic has a fairly flat response. There is no harshness in the sound produced by the mic and it is in fact a warm sound for the ears. Because of the above property, this mic is suitable for both male and female singers and for acoustic instruments. The mic is a favourite for recording acoustic guitars. The maximum sound pressure level (SPL) of the AT2020 is 144dB. This quality makes it possible to precisely reproduce loud instruments and strong vocals. This mic can handle all types of sound sources, like horns, drums and vocals with clarity. Unlike the fragile condenser phones in the market, this mic has a sturdy construction. The mic is 6.38 inches in length and 2.05 inches in diameter. It weighs 12.1 oz. Therefore, it is both compact and not so heavy. It is made of solid cast metal and there is a sturdy wire mesh over the capsule. This is a microphone that is solid and sturdy and can serve the owner for a very long time. It also comes with a stand mount for easy placement of the mic. The design of the mic is like a tank. The mic requires 48V phantom power and runs the voltage to the back of the condenser. Thus, the diaphragm is thin and more responsive that can be found only in higher end microphones. The diaphragm is 16mm in diameter and is great for instruments due to faster transient response. The cardioid pickup pattern of the mic helps to isolate the pattern by rejecting unwanted sound from the sides and the rear. This excellent off-axis rejection property is suitable for recording vocals in a computer-operated home studio. The AT2020 meets the price and performance standard in the condenser microphone market. Its high SPL handling and wide dynamic range makes it a versatile product. The low-mass diaphragm is custom engineered for extended frequency response and transient response. The Cardioid pattern reduces pickup of unwanted sound and improves the quality of the desired sound. These features make it suitable for both home and studio applications. The AT2020 microphone is worth the price spent. Its performance can be compared with the expensive mics in the industry. Having said that, it cannot replace the high-end microphone. It is based on cost vs performance that makes it tough to beat. Here are some small hitches found on AT2020 this the Audio Technica AT2020 Review would like to highlight. The Polar Pattern Selection switch or attenuation pad is not present in this microphone. Due to its lack of pattern switch and roll-off filter, the usefulness of this mic becomes limited in some circumstances. Hence, this mic is suited well for light applications like the vocals and acoustic guitars. Though the package contains lots of other accessories, it doesn’t include a shock mount. Hence, there is a need to buy a shock mount separately to protect the mic from trips and lack of balance. The shock mount is also an essential element for lesser muffled background noise. The source of the sound should be placed close to the mic for better quality. The mic sometimes produces high self-noise. Requires a phantom power supply that should be bought separately. While the above points have been stated as its disadvantage, it is a mic that is easy to work with and is a good choice for beginners and non-professionals. The Audio Technica AT2020 microphone is a general purpose low budget capacitor microphone which exceeds expectations at all levels. Other than the noise level, it is hard to find fault on the mic. In the microphone market, AT2020 is not without competition. But with the advantages listed below in this Audio Technica AT2020 review, it proves time and again that it is worth buying this microphone. Audio Technica has a good reputation in the manufacturing of mics. Their mics are good sounding and good engineered ones. This reputation makes AT2020 the most preferred mic when it comes to choosing between similar priced mics. The price of this mic is another aspect that works as its advantage. As the performance of this mic is outstanding compared to its price, the cost vs performance ratio makes it tough to beat in the competition. There are no complaints on the subjective sound quality of the mic. In fact, it performs better than other expensive mics for some applications. The mic is impressive in its off-axis characteristics – the rear-axis rejection and rejecting sounds coming from 90 degrees off axis is outstanding. The Audio Technica AT2020 is certainly a star performer in the world of entry-level mics. A product should never be judged by its price. The same holds true for the Audio Technica AT2020 Microphone. 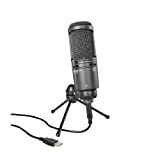 This microphone is a good investment for starters as it is manufactured by a reputable brand. The microphone’s body is well-built; it comes with all the necessary accessories and gives a solid performance at a very attractive price. This is a microphone suitable for those who are in search of a decent entry-level microphone that is simple with a reasonably flat reproduction of sound. It is also popular for the home studios around the world. Many small studios have the capacity to have only few mics that should be used for multiple purposes. As AT2020 can be used for a variety of applications including vocals, acoustic instruments and voice work, it is certainly the best choice for the project studio market. There is no doubt that there are better mics in the market that are costly or cheaper mics with “not so good” quality. But at a better price point, AT2020 offers a tremendous performance. Pick the right Vocal Mic from this TOP 5 list!